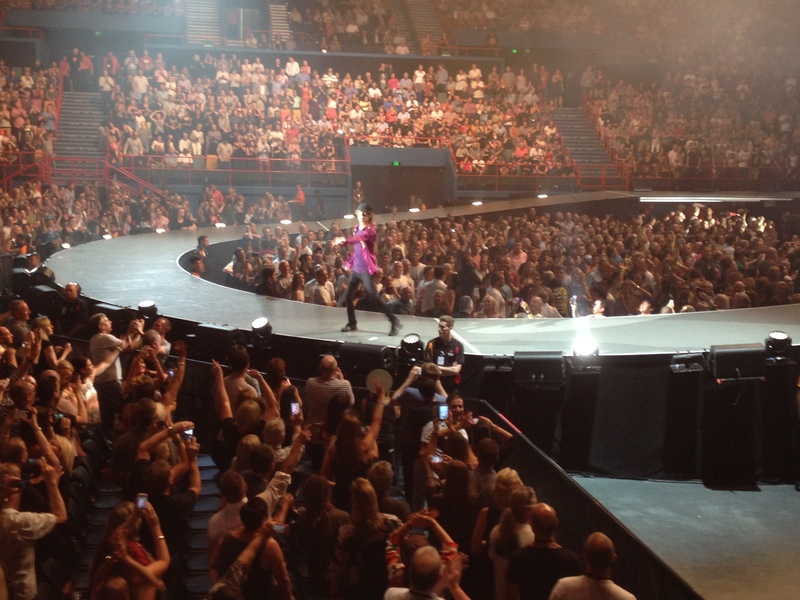 While no apology is needed for the unfortunate circumstances in which the Rolling Stones were forced to cancel their last Australian tour, it’s nice that Mick Jagger acknowledges the fact shortly after an explosive opening double-salvo of ‘Jumpin’ Jack Flash’ and ‘It’s Only Rock ‘n’ Roll (But I Like It)’. It’s also nice that he receives a response loud enough to probably kill every bird within a ten-mile radius. Two songs in and it already feels that incredible amounts of energy have been expended by both band and audience. The lack of a support band hasn’t kept an arena-sized bunch of music fans of mostly advanced years from allowing themselves to be whipped up into a frenzy by Jagger, who almost can’t find enough parts of the stage in which to shake his bony hips and flail his arms like it’s 1969 all over again. Besides the prancing peacock frontman, ol’ Keef and Ronnie are looking mean and lean (and dressed mostly in green) as they puff on cigarettes and interchange licks. Charlie is the epitome of cool and reigns everything in. Touring members are sounding and looking hot. The knowledge that we’re witnessing a bunch of frail septuagenarians roll casually yet efficiently through their hits has been suspended from our minds and we are being drawn into the Stones’ world of swagger, mystery and comfortable trainers, if only for a couple of hours. A punchy 1-2 of ‘Paint It Black’ and ‘Honky Tonk Women’ takes the fervour up a notch before Jagger introduces the band and leaves the stage to let Richards take lead vocal on ‘You Got The Silver’, ‘Before They Make Me Run’ and ‘Happy’. “All you up the back there – I’m thinking of you,” he mocks, in his trademark whisky-soaked voice; the voice that gives rise to the argument that he might be the best vocalist on stage tonight, just as there exists the strong argument that Mick Taylor is the best guitarist present. Not that it really matters, anyway. An extended version of ‘Midnight Rambler’ sees just about all band members do a circuit of the tongue-shaped extended stage, and ‘Miss You’ allows bassist Darryl Jones to unleash his incredibly funky fills. ‘Gimme Shelter’ and ‘Start Me Up’ keep the hits a-comin’, then Jagger cranks his inner dandy up to 11 as he comes back onto the stage draped in huge red feather cape for ‘Sympathy For The Devil’, and ‘Brown Sugar’ gives back-up singers Lisa Fischer and Bernard Fowler the chance to strut their stuff. And now, the obligatory encore. Huge kudos to the guys and gals of Vibrancy, the Choir of the Cuskelly College of Music, for their perfectly-executed take on ‘You Can’t Always Get What You Want’, although their choral careers might have just peaked – sorry guys, it’s all downhill from here. Closer ‘Satisfaction’ does the job, and multiple bows and a spot of fighting over tossed plectrums and drumsticks later, and the night is complete. Not bad for a bunch of guys labelled as has-beens as far back as the early seventies.